Web Content Wizard is Fixed AGAIN! The second talk I am going to give is part of the Boston JS Meetup, which I am very excited to attend for the first time. I'm looking forward to talking to the group and showing off what both Closure and plovr can offer to those in industry. Also, up until now, I have been making decisions autonomously about new plovr features and config options because I did not have a good way to gather feedback from users other than the bug reports I received. To that end, I finally decided to create a Google Group for plovr where users can help influence plovr development and ask questions about how to use plovr. As I noted in the Closure Library group, I would like to extend plovr to help with CSS management and developing against jQuery (among other things), and I believe these features will only be useful to others if prospective users participate in the discussion. We'll see how all of that works out. Finally, one interesting engineering challenge that has plagued plovr since its inception (but has finally been slayed!) is the question of how to manage its dependency on the Closure Library, Closure Compiler, and Closure Templates. With a considerable amount of help from Ilia Mirkin (and a lot of SVN and Hg gymnastics), I finally have a system that I am happy with. Basically, it requires creating a branch for each dependent project to which updates are periodically added and then merged into the main repository. As this is a general problem for open-source projects, I documented it thoroughly on the plovr wiki. This also allowed me to clean up the build process for plovr and remove some unnecessary and/or duplicate dependencies. The release of plovr I did back in December was 11.7 MB, but the new release is down to 8.4 MB, which is the smallest plovr jar I have ever published! Things are definitely moving in the right direction for the project. 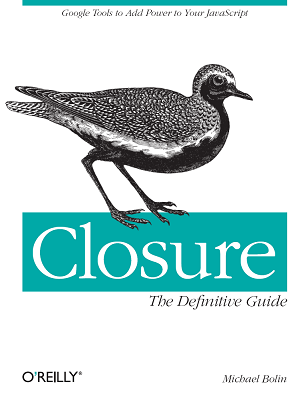 Want to learn more about Closure? Pick up a copy of my new book, Closure: The Definitive Guide (O'Reilly), and learn how to build sophisticated web applications like Gmail and Google Maps! Thanks for your talk last night at the JS Boston meetup. I really enjoyed it and looking forward to learning more about closure.